Haha, see what I did there? The Linkin' Lawyer sounds exactly like The Lincoln Lawyer, no? Oh gosh, small things amuse small minds. Anyway, tonight is another rushed night thanks to plans changing at the last minute. My niece is in the lounge watching Hop, as I make my way through a triple feature of The Lincoln Lawyer, The Way Back and Rabbit Hole. I'm just pissed I don't get to see Never Let Me Go again...too many movies I want to see released in one week, not enough of Tuesday to watch them all in! Jack from Jack L Film Reviews has just moved to Ireland and he's doing an Irish Movie Marathon. One of the films which he checked out was The Wind That Shakes the Barley, a very good movie starring the awesome Cillian Murphy! 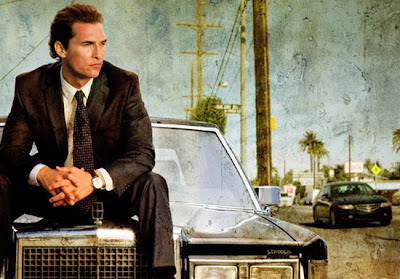 Dave @ Flickers has made a list of the most overlooked performances of 2010. The year may have been and is now long gone, but I'm still not over most of these performances! Defiant Success has been online for two years now. Wish Anna's blog a happy birthday! Haha, the other day I got told that I don't deserve to have a movie blog as I have not watched any of the Harry Potter movies. Oh well, Nikhat at Being Norma Jeane is doing a good job of showing me all the fandom I've missed! The guy who is watching his way through the '1001 Movies You Must See Before You Die' book has just crossed Schindler's List off his list. Which just so happens to be my new favourite movie. Ever. Dislike Somewhere? Join the long list of haters, but know that I frown upon you. Tyler at Southern Vision liked it, and also ponders over why he likes a lot of movies that other hate. Good old Custard at Front Room Cinema is teaching us all how to become a better movie blogger. And damn, that post got 64 comments! Jealous! I hope you all have a pretty relaxed and awesome week! Thanks, Stevee. Is Never Let Me Go out this week? I had no idea... I am eagerly awaiting Rabbit Hole, for it has been a long time since I've seen Nicole Kidman in something really good (Eyes Wide Shut and The Hours are musts for her). I look forward to your Magnolia review (although I definitely don't want to rush you, especially since you need to watch it again), and I wish you luck with catching up with everything. YOU WATCHED THE PIANIST!! It's my most favourite Holocaust film ever. And I dunno who I have the bigger hots for- Adrien Brody or Roman Polanski (okay I do, but still). Thanks for the link! Don't listen to those people, you're a great movie-blogger. I haven't seen Star Wars...I'm pretty sure there are people who think I shouldn't be allowed to live or something. I really liked The Way Back, it's rather underrated in my opinion. And Saoirse Ronan is great, definitely one of the most talented young actresses around. Tyler - Never Let Me Go is out this week...such a good film. Rabbit Hole was quite good too, and Nicole was definitely brilliant in it. The Hours is a must for her - I love that movie. And I'll get around to watching Magnolia again on Friday (maybe). Very busy at the moment, taking the night to breathe. Nikhat - Oh, I loved The Pianist so much. Adrien Brody is pretty hot, too. And Roman Polanski isn't too bad either!